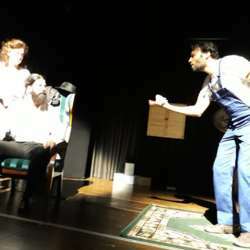 You must be a member of the Munich Theatre Lovers Group to attend this activity. Would you like to join this group? Let’s go to theProtected content enjoy the Italian noir comedy “l’ Ebreo”, played by “ProgettoQuindici”, listen to its author and… have a drink afterwards! After the great successes of “Il Nome”, “Chi ha paura di Virginia Woolf?”, “Il rilegatore Wanninger” and “Napoli per due”, the Italian theatre company ProgettoQuindici performs Gianni Clementi's noir comedy "L 'Ebreo" on the stage of the Black Box. Rome Protected content a bourgeois apartment in the ghetto: the play begins. It's been 10 years since the end of the war, but the sense of conflict is still very much present in the society…. Sharp dialogues, emotions, surprises and revelations follow!